Mazur Bros. & Jaffe Fish Co.
Mazur Bros. & Jaffe Fish Co. Inc. first appeared in the New York City (Manhattan) telephone directory in 1939. The original location was 233 Front St. in the Fulton Street Fish Market. They arrived late at Peck Slip, around 1989, and probably left here shortly before 2005 when this picture was taken. 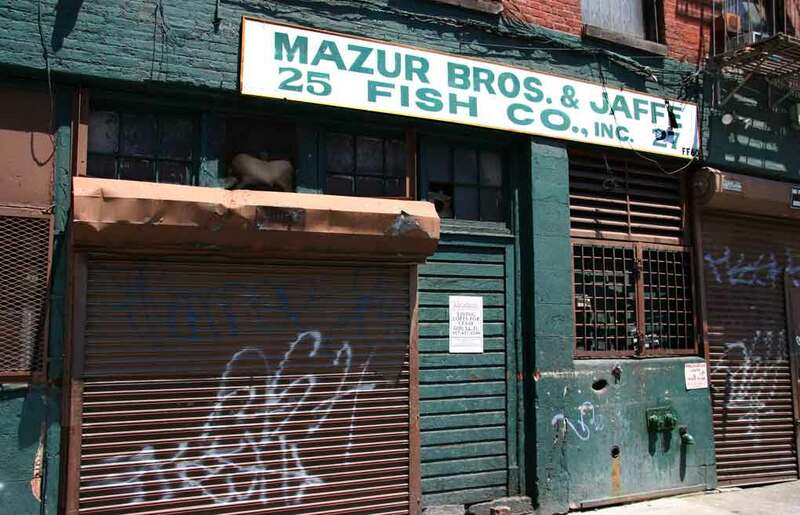 As of December 2014 Mazur Bros. & Jaffe were still in business, now located in the South Bronx at Food Center Drive. The partners were Isidor Mazur (1893-? ), Benjamin Jaffe (ca.1882-?) and Samuel Silverstein (1891-1964). All were immigrants from Russia in the early 1900s. Isidor Mazur and Samuel Silverstein both registered for the World War I draft in 1917. They were in business together at that time as Mazur & Silverstein at 148 Orchard St. Each lived downtown on the East Side. Samuel Silverstein and Benjamin Jaffe appeared together in the 1920 U. S. Census when they lived at 358 South 3rd St., Brooklyn. Jaffe was called Barnet Jaffe in the census. Living with him were Abraham and Martha Silverstein, his father-in-law and mother-in-law. His wife was Hannah, elder sister to Samuel Silverstein, who had his own wife and family at the same address. Isidor Mazur's naturalization petition (dated 18 July 1928) states that he was born 15 June 1893 at Grodna, Russia, that he emigrated from Hamburg 12 July 1910, and that he arrived in New York 23 July 1910 aboard the vessel Kaiserin Auguste Victoria. All three partners appeared in the 1930 U. S. Census. Benjamin Jaffe and Isidor Mazur both lived at 791 Linden Blvd., Brooklyn, and had back-to-back entries in the census. Samuel Silverstein lived a block away at 797 Lenox Road, Brooklyn. By 1940 Benjamin Jaffe had died and his place in the business was taken by his son, David Aron Jaffe. Isidor Mazur still lived at 791 Linden Blvd., as did David Jaffe. David Jaffe lived with his brother-in-law, Charles Kaplan, who married Frieda Jaffe, David's sister. Isidor Mazur registered for the World War II draft in 1942, still living at 791 Linden Blvd., but now declared himself "unemployed." In 1947 Mazur Brothers and Jaffe Inc. became owners of the four-story loft building at 232-234 Front Street, which they had occupied since 1944. The business stayed here until moving to Peck Slip around 1988/89.